Please find below our section of S18, Mini S18 and MC120 tunable inductors. 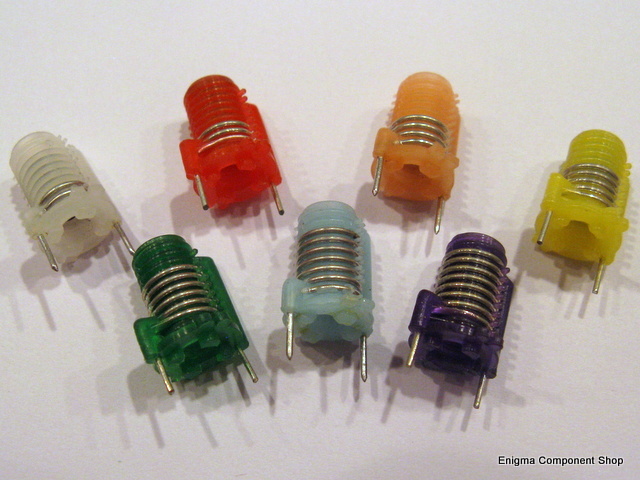 These are popular for homebrew projects where a good quality variable inductor is required. Please note: The Toko S18 is now long obsolete and very hard to find, therefore we stock both original and generic parts (which perform exactly the same). The generic parts are now becoming rare, so we do not recommend the S18 for new designs, or where a large quantity may be required. Below is our range of 'Mini S18' tunable inductors. They are the same format as the S18 but physically smaller, so do not offer the same inductance range as the bigger parts but are a useful alternative where a smaller inductance is required. The Mini S18 has a slotted brass core. Please contact us for quantity discounts. Similarly to the S18, the Toko MC120 is obsolete so we now stock generic equivalent parts. The MC120 offers similar inducatance and identical pin spacing to the S18 so we recommend these for new designs. Please contact us for quantity discounts.